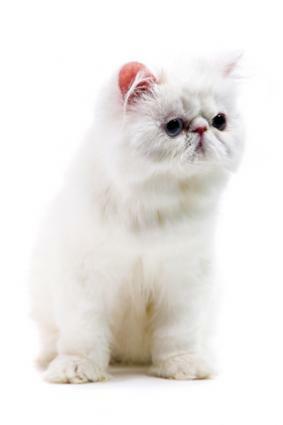 Persian cats are feline royalty, and they make loving and loyal companions. As kittens, Persians are adorable balls of fluff, and they grow into gorgeous long-haired beauties. If you're considering one of these wonderful kitties, it's a good idea to learn a bit about the breed characteristics and how to care for them. 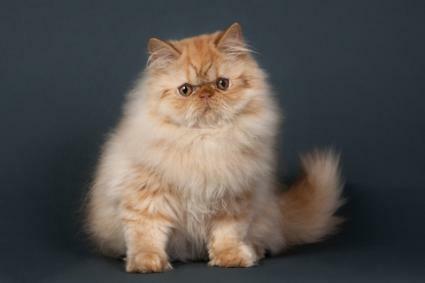 Persian cats definitely hold celebrity status amongst all of the cat breeds seen today. Their long, luxurious coats, and those amazing eyes set in unusually flat faces gives these felines an almost unreal appearance. It's easier to believe one might be a stuffed animal until you actually see it move. According to the Cat Fanciers' Association breed standards are as follows. A Persian's head is easily its most distinctive feature. It's larger and generally rounder than that of the average cat, with large, round, wide-set eyes and a sweet expression. The ears are fairly small with rounded tips, and they should be set wide apart and tilted slightly forward. The cheeks are also quite round, and the short nose appears to be aligned with the eyes. Underneath all that glamorous beauty, you'll find one very stocky cat. 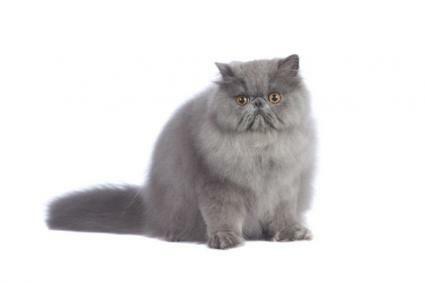 Persians are round, in every essence of the word, with short, stocky legs to support their extra girth. Their surplus of long fur does an admirable job of hiding any angles they might have left, adding to this breed's cuddly appearance. Their tails are short but in proportion with the size of their bodies. While there is no particular weight range the Persian should fall in, these cats should be full bodied and balanced. The Cat Fanciers' Association (CFA) breed standard does state individuals should be medium to large sized, and have good muscle tone without being obese. Persians are very sweet in nature, and tend to prefer quiet, peaceful households. These are quiet cats with soft voices, and they seem to enjoy displaying themselves like the fine pieces of living artwork that they are. The ideal Persian coat has a fine texture and is long, thick and glossy. Variety is truly the spice of life when it comes to coat colors. This breed is divided into no less than seven separate coat color groups, with plenty of choices in each. Here's a sample of what you'll find. Bi-colors consist of white fur and one other color with a distinct pattern of white on the legs, feet, belly and muzzle. As you can imagine, Persians do require some additional care to keep them looking their best. Daily brushing and an occasional bath will help keep the coat from matting. Give their faces a gentle wiping each day to remove eye run-off. Not being terribly active cats, these beauties will also require the occasional nail trimming. Luckily, this breed is a hardy one, and individuals frequently live well into their teens. Persians really are "indoor" cats, and should be kept inside to lessen their chances of picking up parasites that would be hard to remove from such abundant coats. Prospective owners should be aware that there are a few health issues related to this breed. Idiopathic seborrhea - This condition results in an overabundance of skin oil and a bad smell. Chediak-Higashi syndrome - This condition affects smoke-blue colored Persians and causes excessive bleeding on injury. Polycystic kidney disease - Persians may be more prone to this than other breeds. Congenital eye defects - This impacts an affected cat's ability to see in dim light and bright light situations. 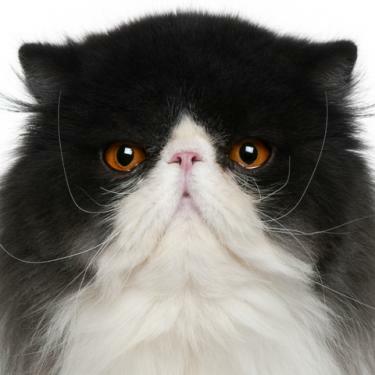 According to the breed's history at the CFA website, Persian cats may have been traced back as far as 1684 B.C. These long-haired cats have even been spotted in hieroglyphics. Many believe they moved from their country of origin, Persia, through caravans that traveled to other parts of the world. Persian World states that although the history of where this cat originated may be sketchy, breeding programs for Persians began in Italy and France as far back as the 16th Century. The breeding program advanced further and the development of the Persian as we know it today began in Great Britain. Persians were entered in the first cat shows in Great Britain in the 1800s, and they were a popular pet at the time. By the early 1900s, Americans began to import Persians into the United States. Persian cats are easy to live with personality-wise, but they are definitely not a breed to buy without careful consideration. Unless you are prepared to become a part-time pet groomer or keep the coat clipped short, you may want to choose a less demanding breed such as a Burmese or Exotic.